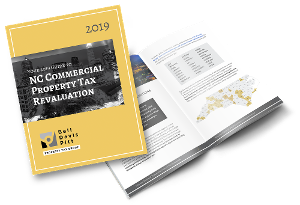 The 2017 property tax revaluation in Cumberland County resulted in an increase in the assessed values of commericial properties, but a decrease in the overall tax base. County Manager Amy Cannon believed the County's Board of Commissioners would need to raise the tax rate to offset the decline in the tax base. We wrote previously about House Bill 2, which would expand the current 40% property tax exclusion afforded to the permanent residence owned and occupied by certain disabled veterans or their surviving spouses to 100%. The bill would also create a new exemption for surviving spouses of emergency personnel officers killed in the line of duty. House Bill 171 was filed late last month seeking to cut the property tax exclusion for equipment used to generate solar energy from 80% to 60%. The Guilford County tax director has reported that 75% of all properties have increased in value as a result of the 2017 revaluation, according to an article in the Greensboro News. This compares to 46% of the properties increasing in value during the last revaluation in 2012. No indication was given as to the extent of the valuation increases. 2017 is a revaluation year for Orange County, which includes the cities of Chapel Hill, Hillsborough, Carrboro and Mebane. On March 3, the Orange County Tax Office will start sending revaluation notices. Owners of commercial properties there should pay attention to these important notices.